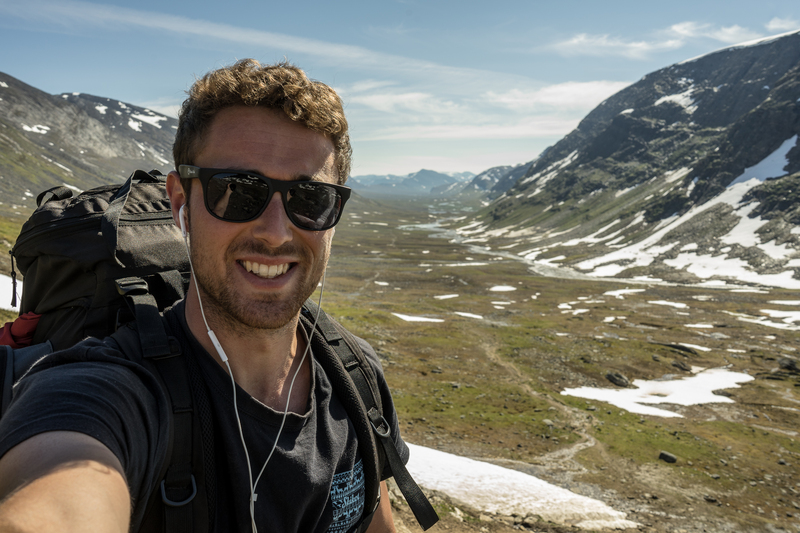 Different from what you would expect, hitchhiking seems to get easier the emptier the roads and the more remote the places you are trying to get to. A Finnish couple on their way to visit grandma left me at a random junction only to pick me up again after their visit. A fighter jet pilot on a fishing trip insulted all the reindeers that wandered in the road in search of a breeze. A Ukrainian couple with a little baby and an overload of delicious pastries offered me a whole bag of them. 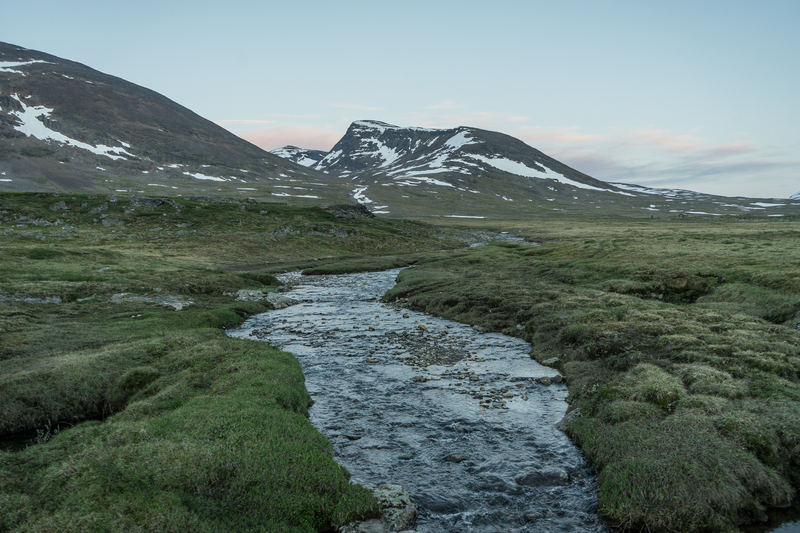 Two Finnish women in their forties on a road trip to Norway told me of their Kungsleden adventure 20 years ago. 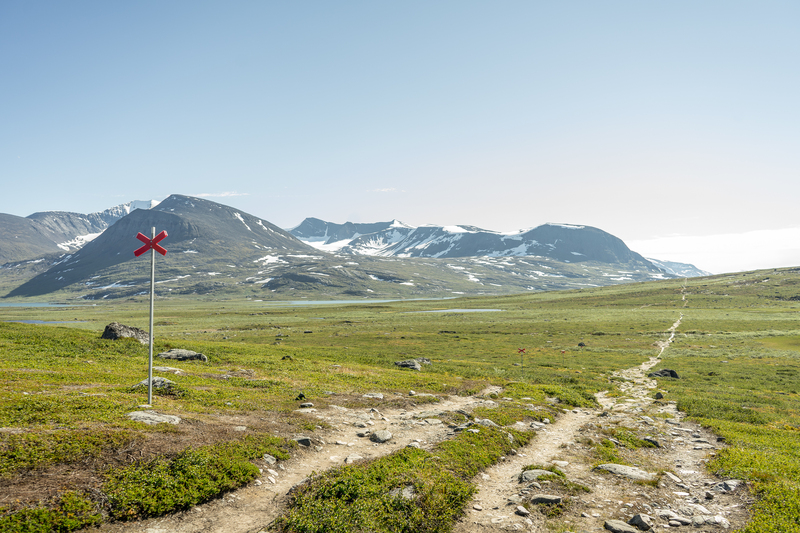 450km on a Sunday, across an international border and on secondary roads between Rovaniemi and Abisko, the starting point of the Kungsleden trail in northern Sweden flew by. It took only a few hours and the determination that everything would be ok, really. I arrived at 7 in the evening, in time to buy a map and a few provisions before the little shop at the start of the trail closed at 8. 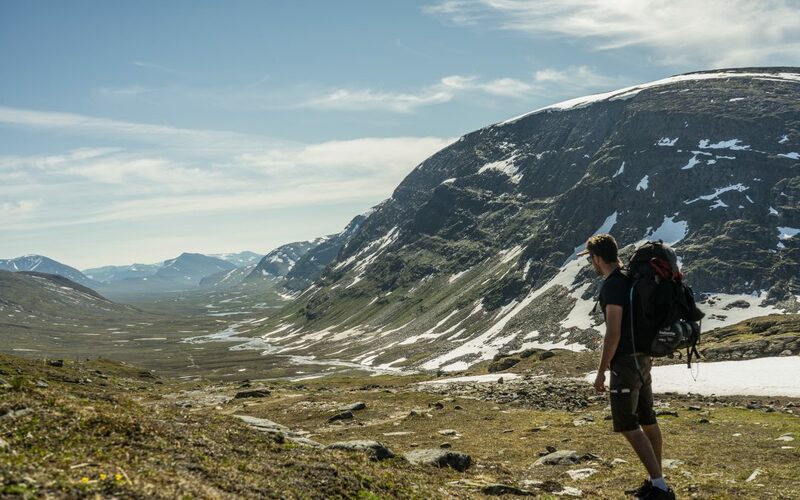 Kungsleden, Sweden’s best known walk and featuring in National Geographic’s top 15 of best hikes in the world, is a superb wilderness trek in Lapland, well inside the arctic circle. 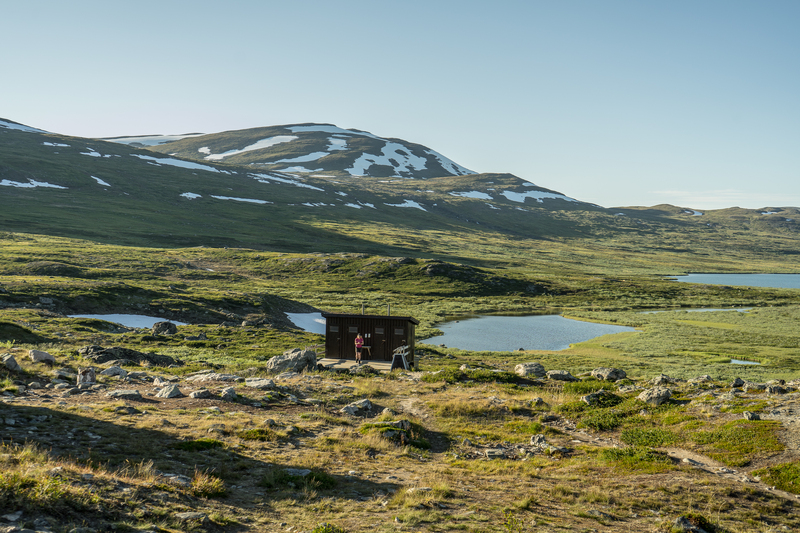 The trail runs for 440km through an enormous area said to be Western Europe’s last major wilderness, with only a series of mountain huts, placed about a day’s hike apart, to provide shelter during the cold northern nights for those willing to pay for it. 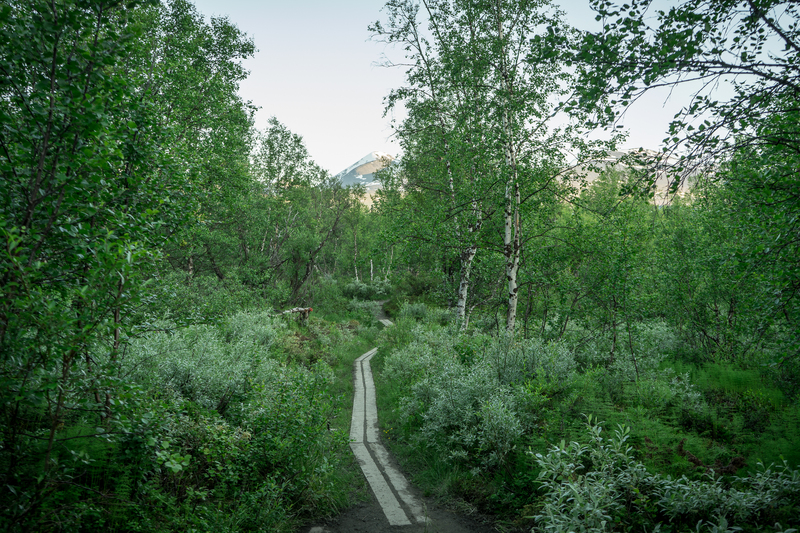 Attracted by the physical challenge, adventurous aspect, disconnectedness and raw natural beauty I set out to walk approximately half of the trail. 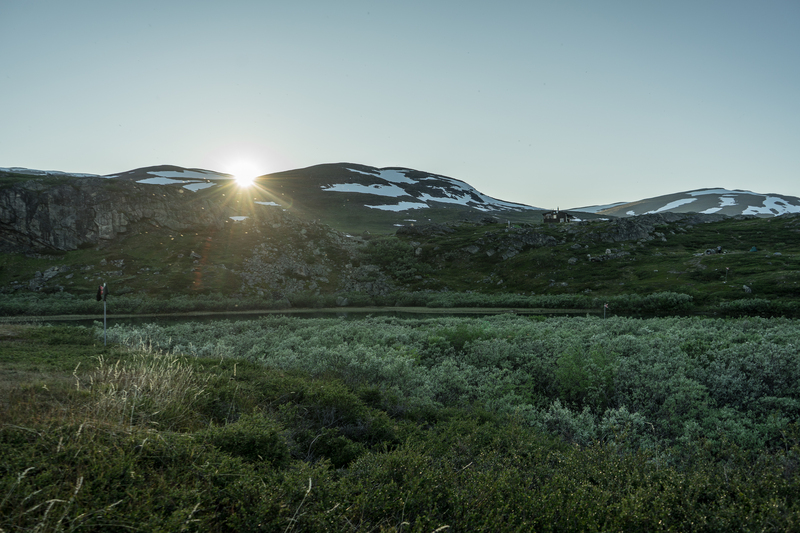 As Kungsleden can be walked north to south or south to north I chose the former to keep the sun on my face, no small consideration in the arctic. After a quick dinner next to the shop at the start of the trail and the obligatory weighing of my backpack (20kg!) 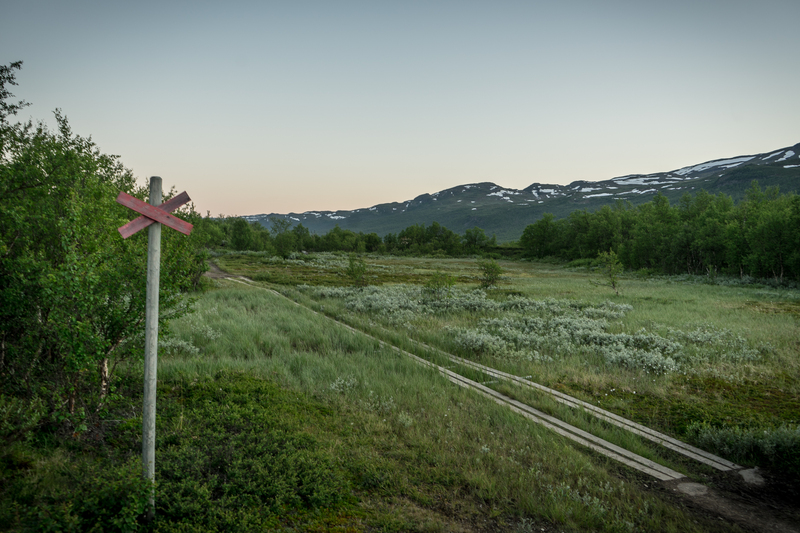 I started the first section, from Abisko to Abiskojaure around 9pm. 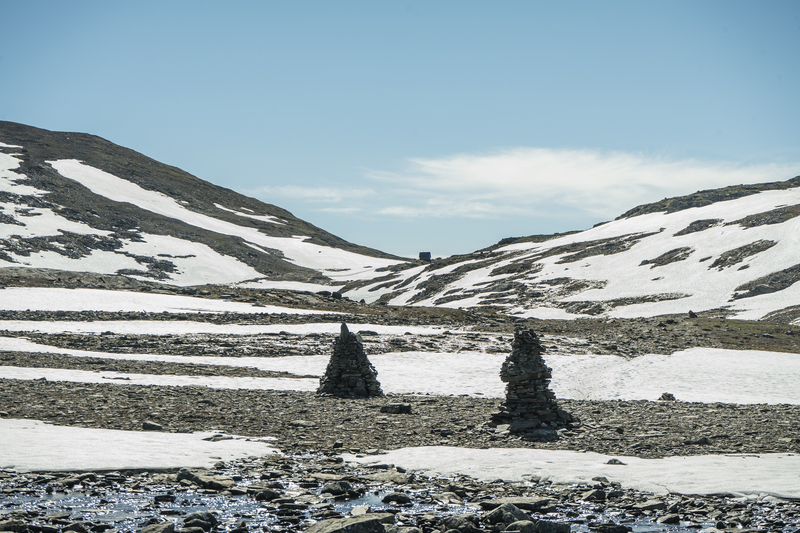 As most people prefer an early start to be able to relax once they arrive at the mountain huts, the trail was deserted. The only 2 hikers I met were walking in the opposite direction. They were almost at their final destination, I thought as we crossed each other. Hollow-eyed and with hunched shoulders, sweating, smelly and probably hungry they stood in stark contrast to myself. I was fresh, well-fed, energetic and practically running the first few kilometres. To be fair they must have completed at least 106km of hiking as that is the distance to the first entry point accessible by road. I asked myself if I would be looking like that as well in a couple of days. Time would tell. 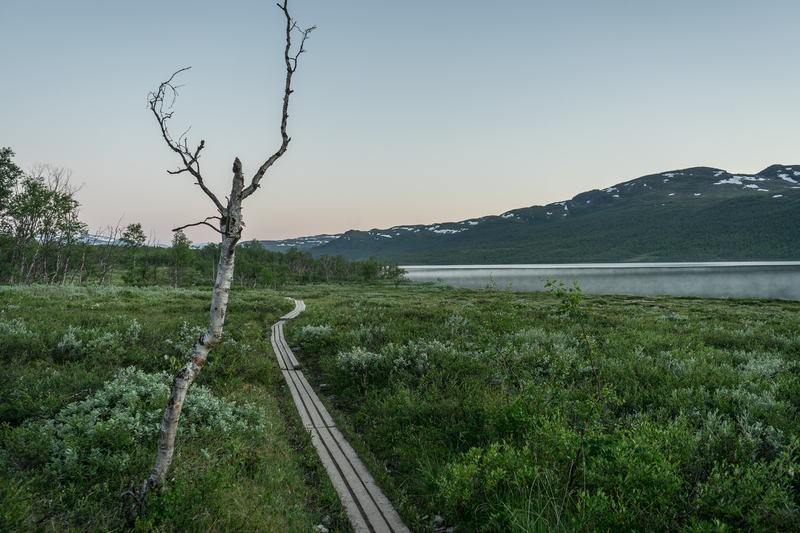 I walked for a couple of hours into the evening and night until at long last I saw the abiskojaure mountain hut at the shore of a distant lake, shimmering in the midnight sun. 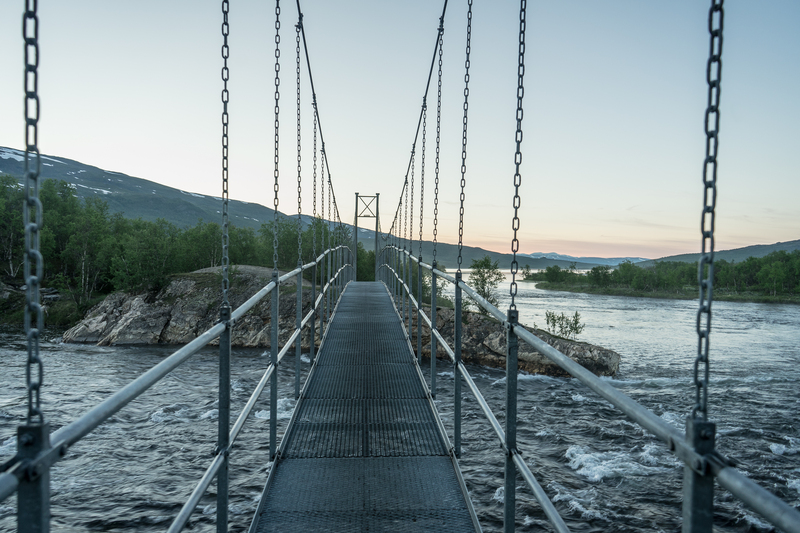 Crossing a suspension bridge over a fast-flowing river I got a good overlook of the camp. 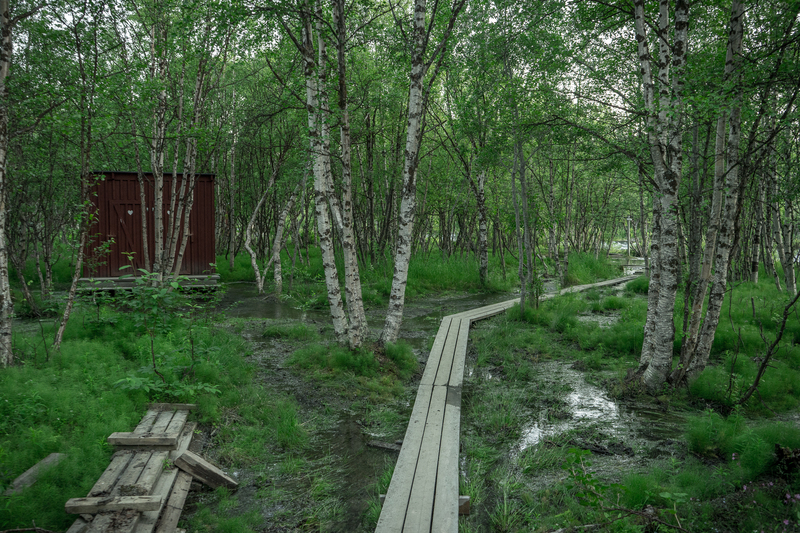 A few huts were spread out across the broad river bank, surrounded by thick birch forest. 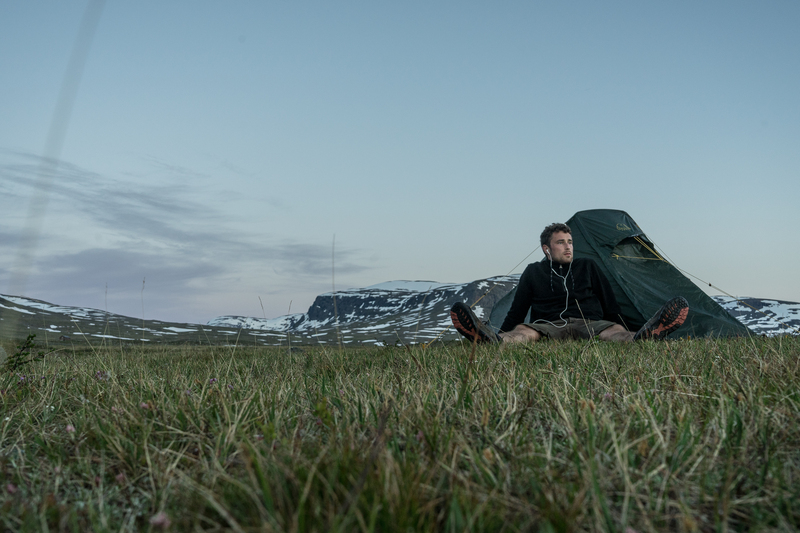 Apart from the occasional snore that was audible from some of the tents that were pitched between the scattered wooden huts everything was quiet and peaceful. I found an empty spot in the middle of the clearing, sloppily put up my tent and hit the hay. It had been a long day and sleep was more than welcome. The next day I awoke late. All around me people were already shuffling about, preparing the next stage of their hike. Tents disappeared in tiny compression sacks. Drinking water was fetched from the river while teeth were brushed. In one of the huts a little shop sold the most basic products. Due to the fact that all goods have to be brought in by snow mobile before the melting of the snow around April everything was both unspoilable and expensive. 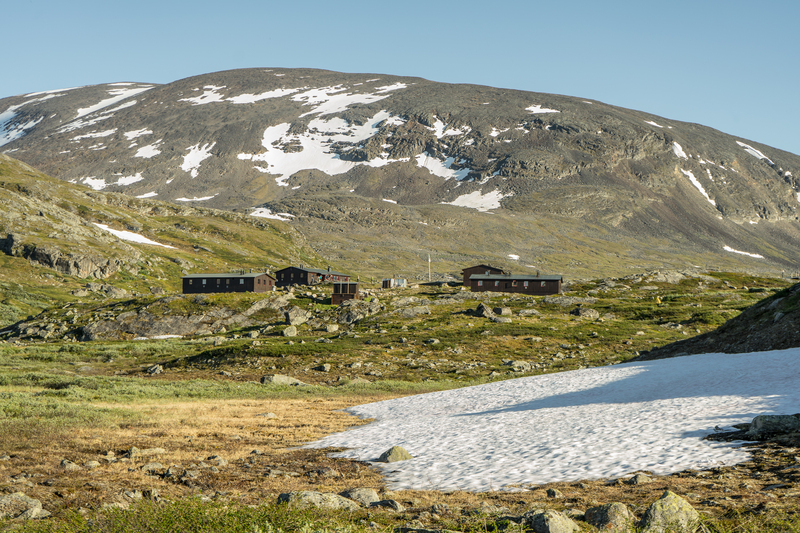 I withstood the temptation to try a particularly chemically looking kind of fluid cheese squeezed in what looked like a toothpaste tube and said hello to the warden of the Abiskojaure hut, a sixty-something lady with grey curls and yellow rubber boots. “Just some crackers and salami for me please,” I said while gesturing at my scanty selection of products on the counter. “When did you arrive?” She asked. “I didn’t see you before.” “Around 1 am last night,” I responded. 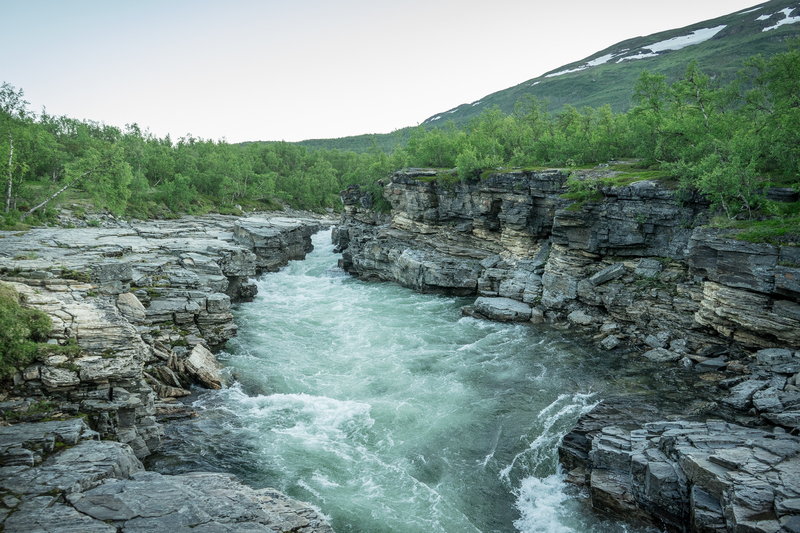 “I left Abisko pretty late.” “In that case you’ll have to pay the camping fee,” she said. 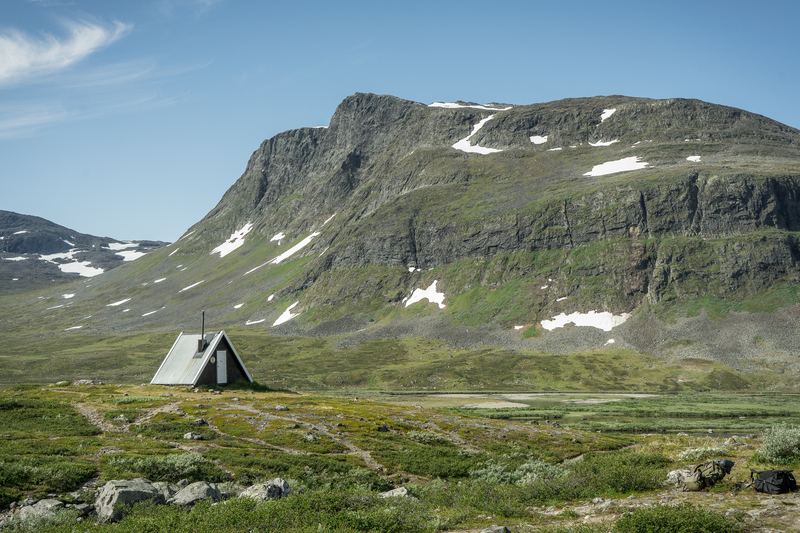 “There’s a 15€/night fee for camping in the vicinity of the huts and for using the facilities,” she interpreted the confused expression on my face correctly before I could say anything. 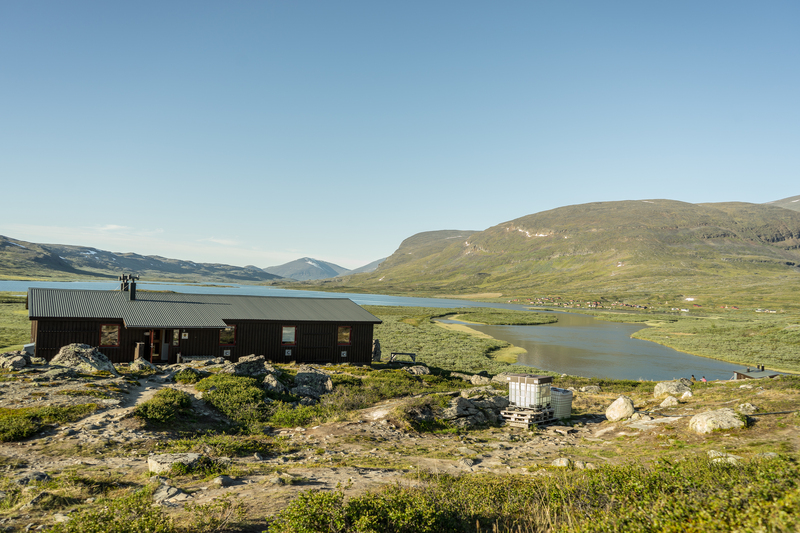 By facilities she meant the compost toilets, the gas-stove equipped kitchen and the occasional sauna that most of the huts along the trail offer their guests. None of hem had running water or electricity though. Grumpily I paid the fee as well as my pathetic groceries. 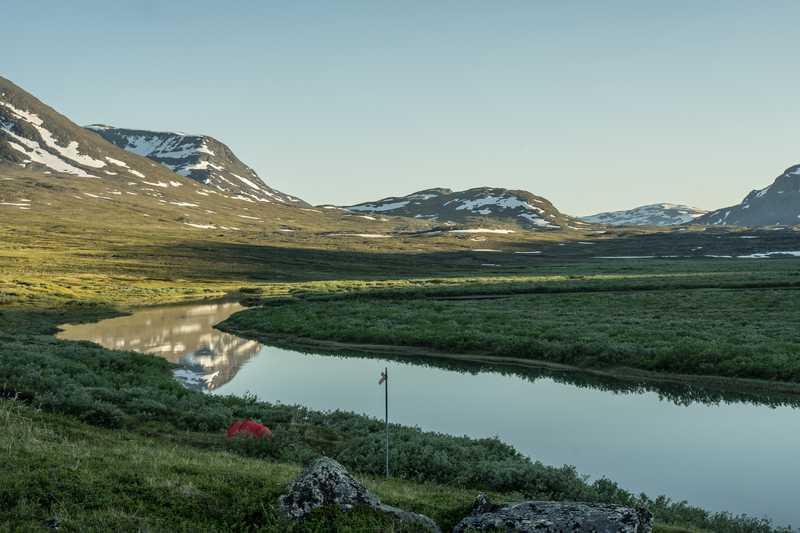 I felt cheated, for I had not used the sauna and only boiled 20cl of river water in the kitchen to make some coffee. “Starbucks is a bargain compared to this,” I muttered to myself while exiting the shop. After breakfast I packed up my stuff and, as one of the last people to leave the Abiskojaure hut, set out for the second stage of the trail. 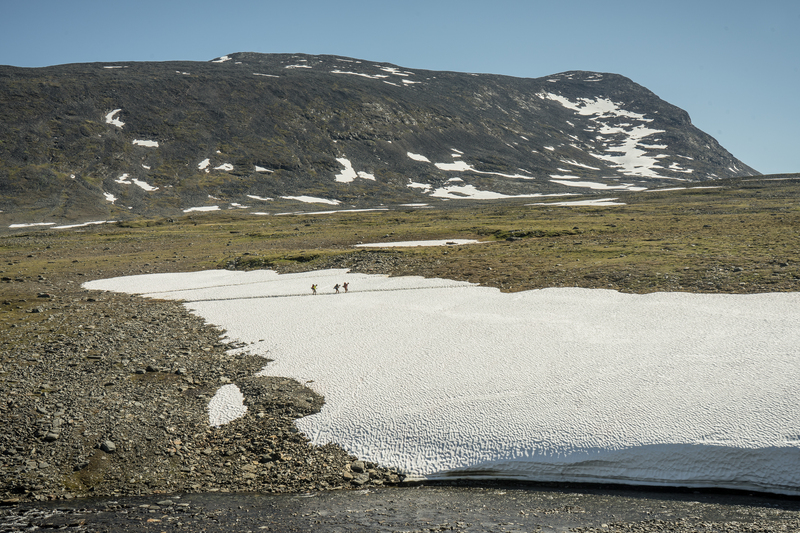 This part was supposedly one of the hardest and with 20km also longest days on the trail. 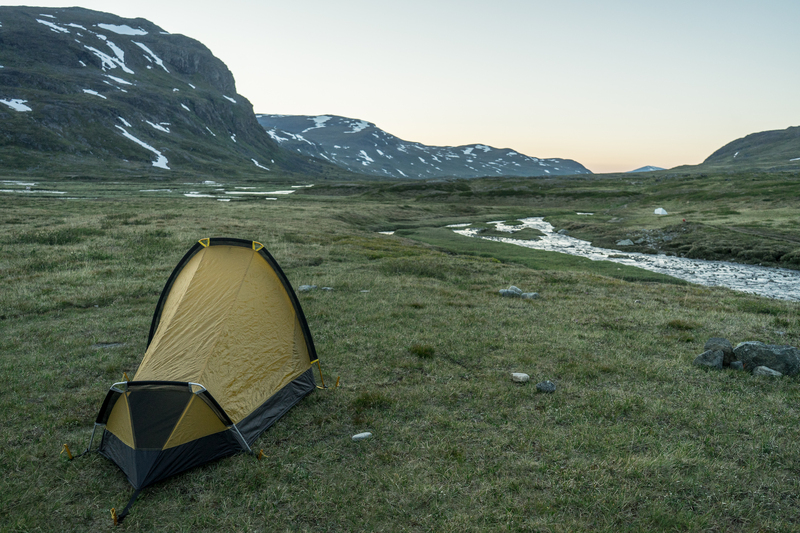 While hiking, I contemplated how to deal with the camping fee in the days to come. 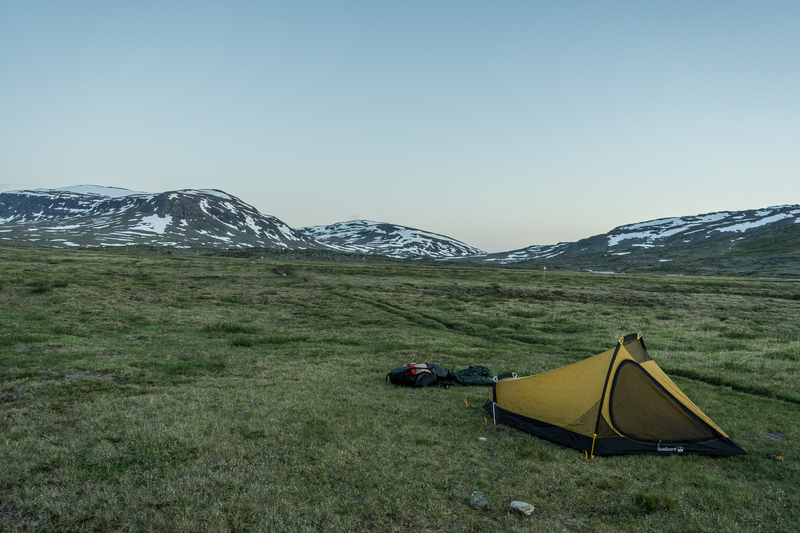 By no means was I planning on paying 15€ a night just to camp next to a hut while I could do it for free a bit further. 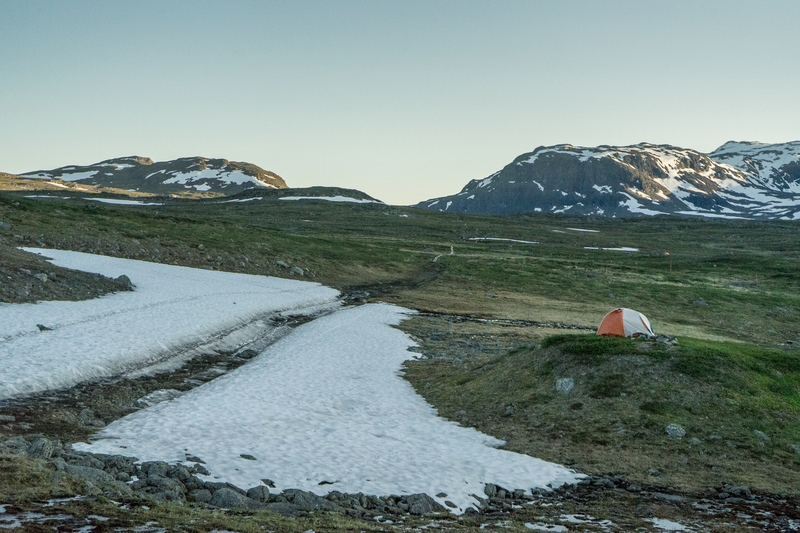 On the other hand I did need my daily dose of morning caffeine in order to function like a human being, and the fact that I didn’t carry a gas stove implied that I would have to rely on the kitchens of the mountain huts that I would still be passing. Discussing the best tactic with a fellow hiker I learned that as long as you passed by the huts before four o’clock in the afternoon and did not camp around there, you could use the facilities for free, provided you had a membership card of the Swedish Tourist Association, which I promptly forged. “I need to use the kitchen twice a day,” I thought, “for morning coffee and for a hot meal. 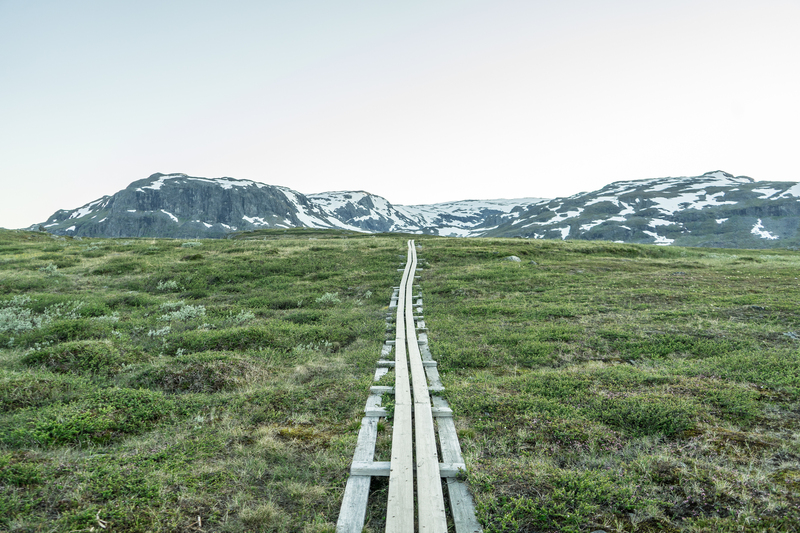 And both have to happen before 4pm.” For a moment I considered to reverse my entire eating pattern and start off the day with coffee and a 1000 calorie hot meal in order to limit my use of the kitchen to only once a day, but my stomach protested against the very idea so I hatched a new plan: Camp one or two km before a mountain hut to avoid the fee, hike the remaining distance the next morning, use the kitchen, then hurry to the next hut before 4pm for lunch. Continue on my way and have a cold dinner somewhere along the way. Repeat. This whole schedule did mean that I would be walking double distances every day, but as the average daily distances were not huge, the weather would be nice all week and there’d be plenty of light during the evenings, I decided to go for it. 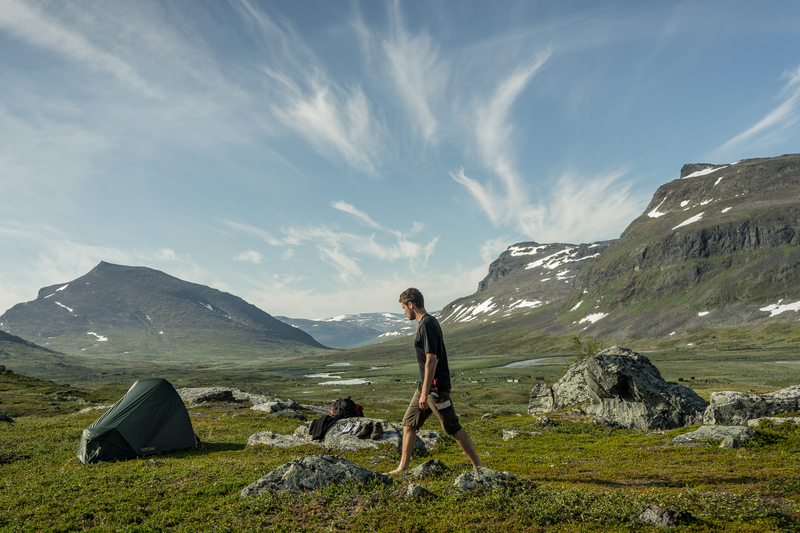 Soon my life on the Kungsleden settled into a relaxed daily routine. Wake up at 4 am. 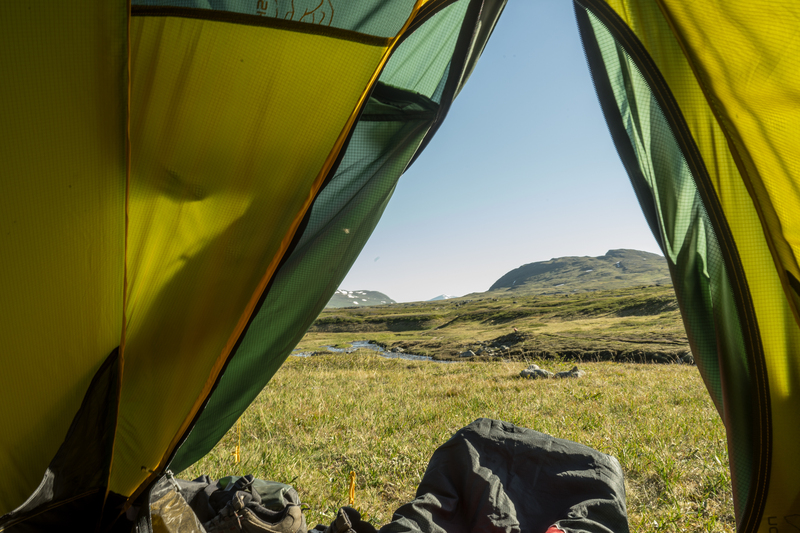 Put head outside of the tent and see the sunrise. Feel the warmth return to the valley after a freezing cold night. Take pictures if appropriate. 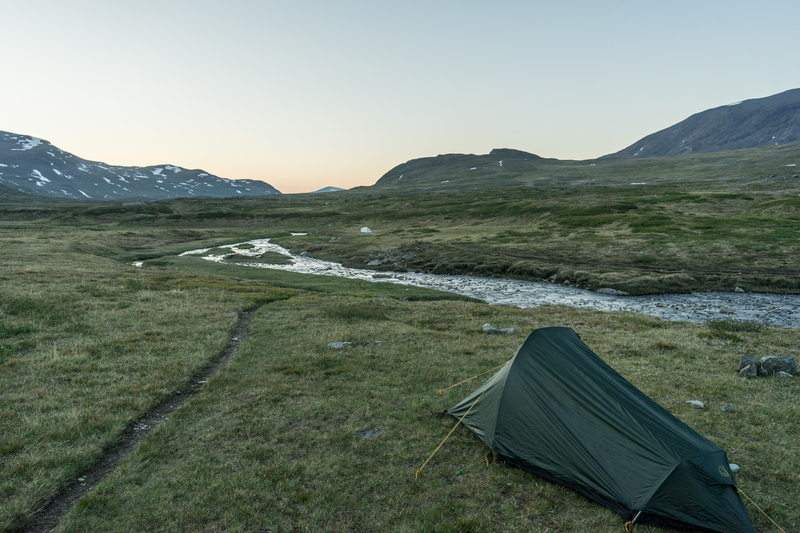 Crawl back into sleeping bag and return to the realm of blissful sleep. Wake up again around 9. Remove all 5 layers of clothes and search desperately for clean spares. Pack up stuff. 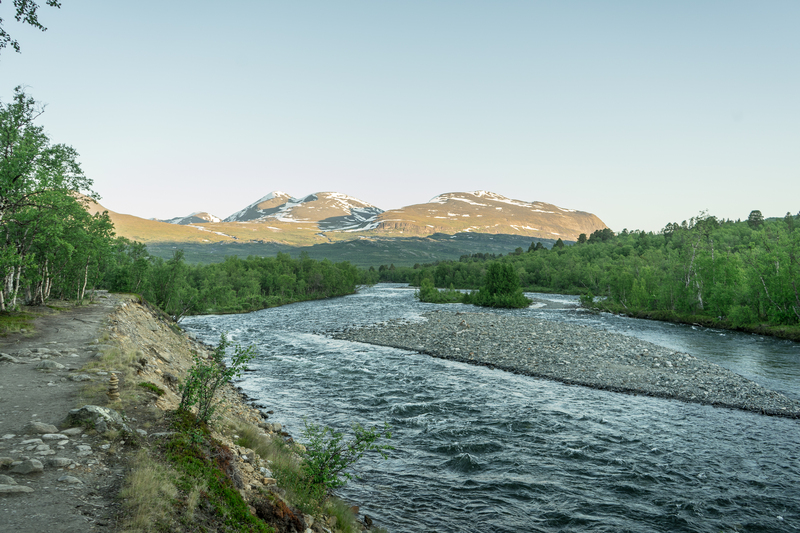 Brush teeth and refill water bottles from the nearest river. 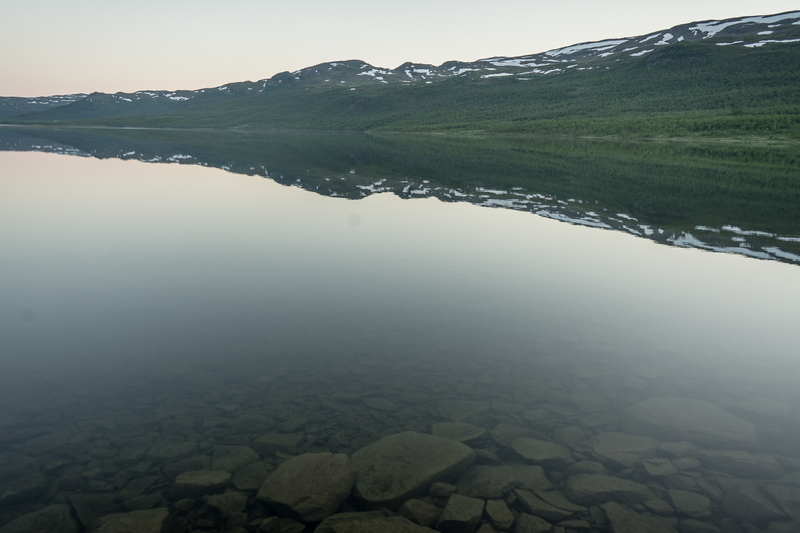 Take in the amazing landscapes. 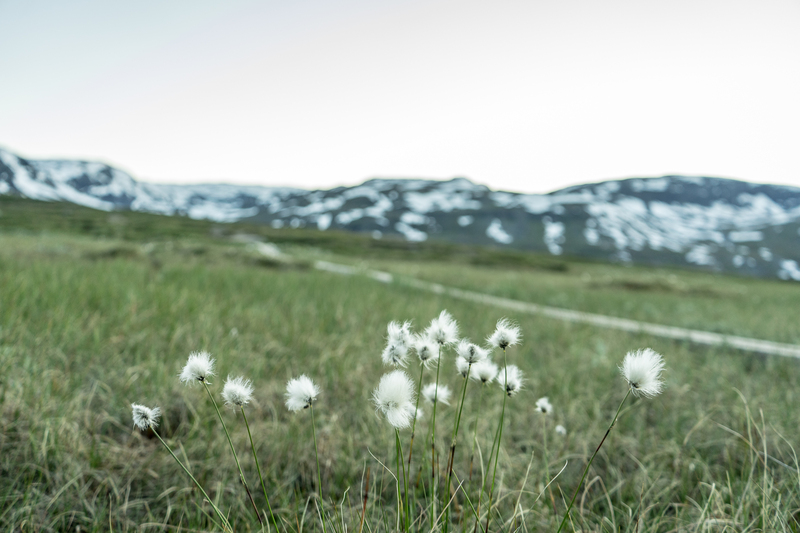 Walk for half an hour to the next mountain hut, with sleepy eyes and dreaming of coffee. Hope nobody talks to you during this head-on collision with the new day. Have a late breakfast in an empty hut while chatting with the warden. Charge camera batteries with portable solar panel. Pay a quick visit to the compost toilet as a direct consequence of the coffee. Hoist the backpack on the shoulders again. Mentally prepare for the next stage. 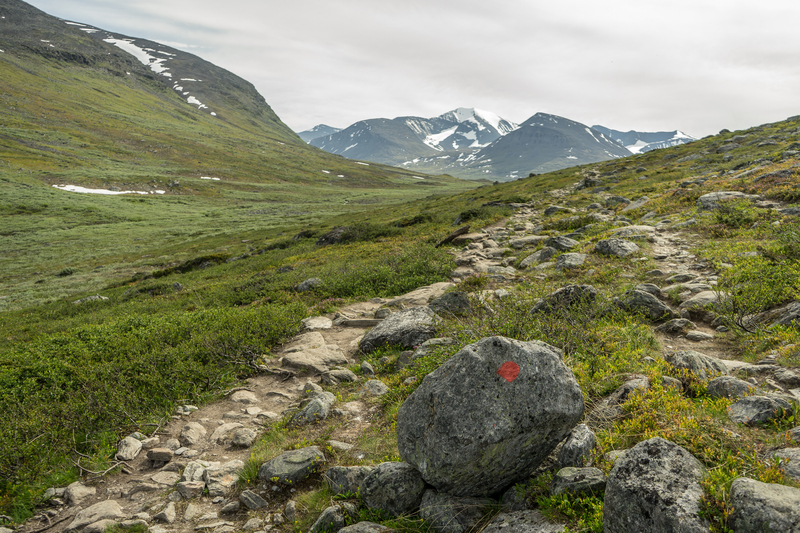 Follow the trail for approximately 12 to 20km. Listen to music. Sing along loudly. 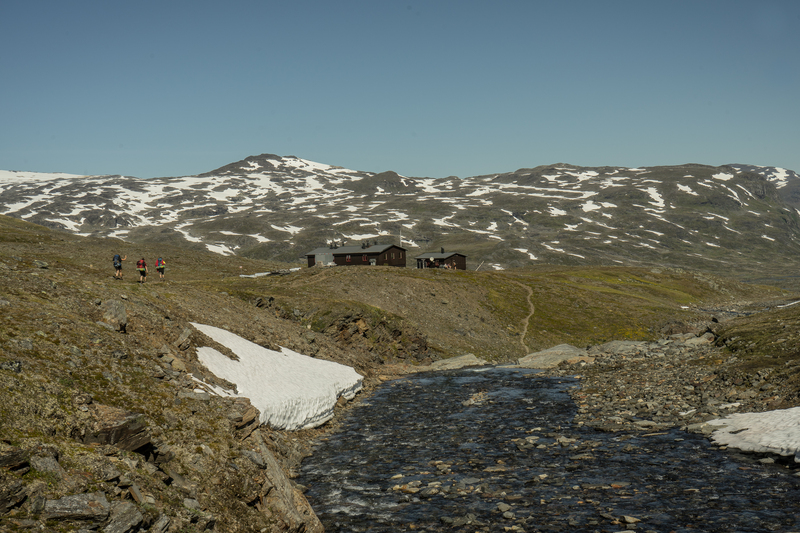 Arrive at the next hut with a sour back and a red face. Boil water before the clock of 4. Add water to a eat-out-of-the-bag 1000 calorie adventure meal. Be surprised at the relatively good taste of the powdery content. Drink lots of water and, depending on the intensity of the efforts made, a coke. 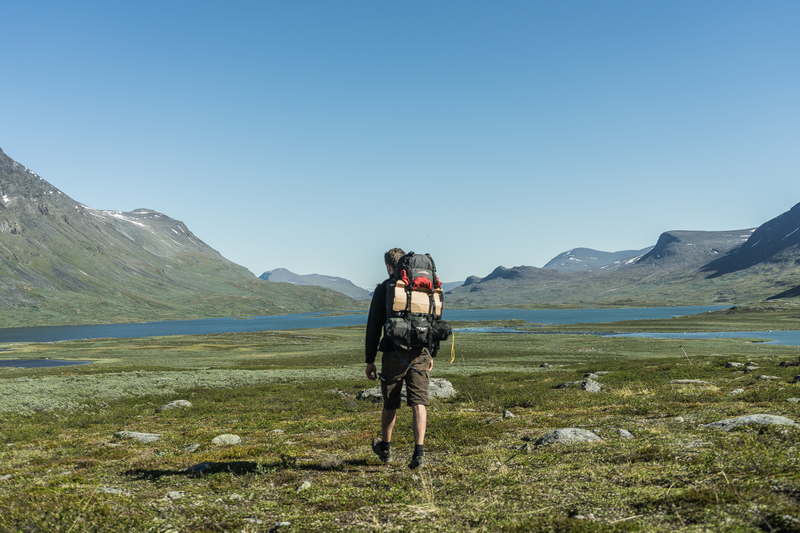 Check for the direction of the wind and the position of the other hikers, then remove shoes. Siesta in the shade of one of the huts from 4pm until 6pm. Hike for three or four more hours. Have dinner with crackers, salami and molten cheese. Chocolate bar for desert. 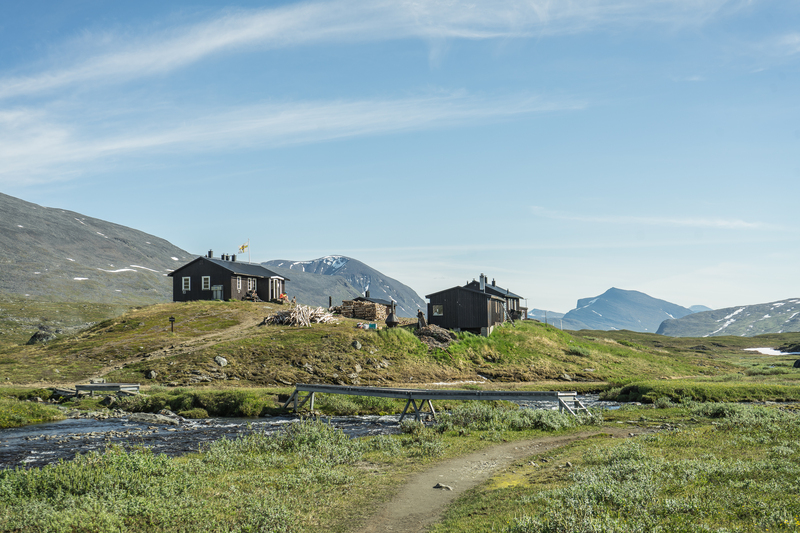 Find picturesque camping spot under the midnight sun. Rest feet after yet another 30km day. Enjoy well-deserved rest. Walking twice the distance of most other hikers I made a steady progress. Four days into the hike I was halfway what was supposed to be a 13 day journey. 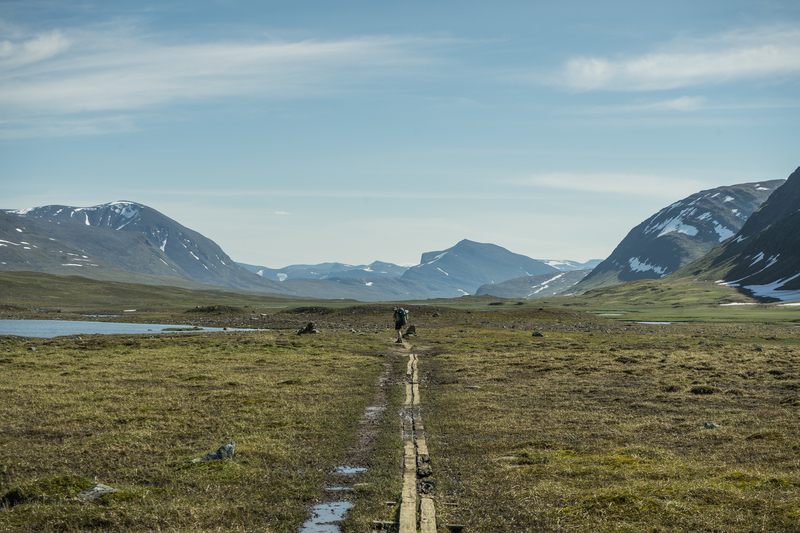 I had covered roughly 100km of the northernmost section of the trail that penetrates the vast arctic landscape of Sweden. 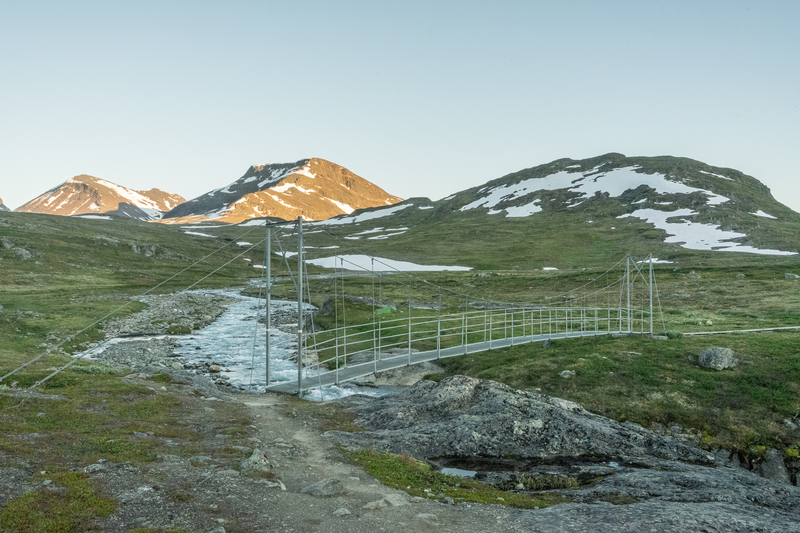 The trail continued endlessly, through birch forests, open tundra and big glaciers, over high mountain passes that got you up to your knees in snow before descending again into broad river valleys and across the shoulder of Sweden’s highest mountain, Kebnekaise. 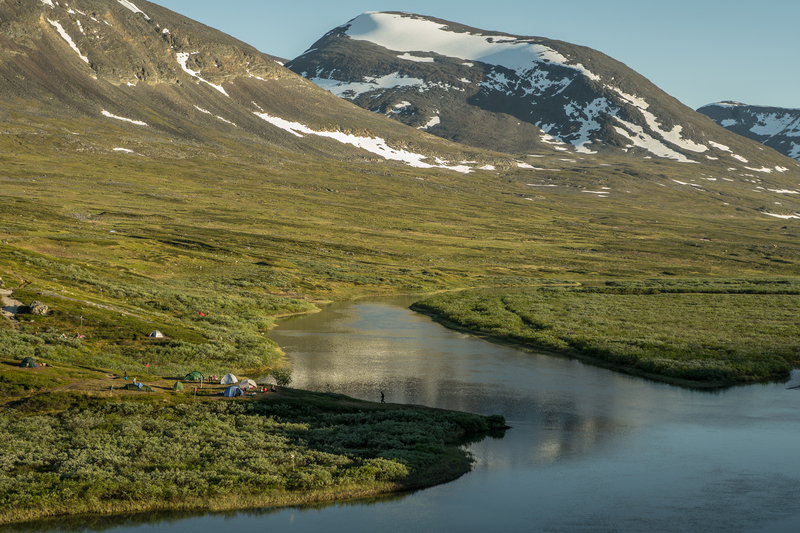 The vibe truly felt like ‘far north’, with no cellphone connection, a palpable feeling of emptiness and low-angled light that stirred the soul. 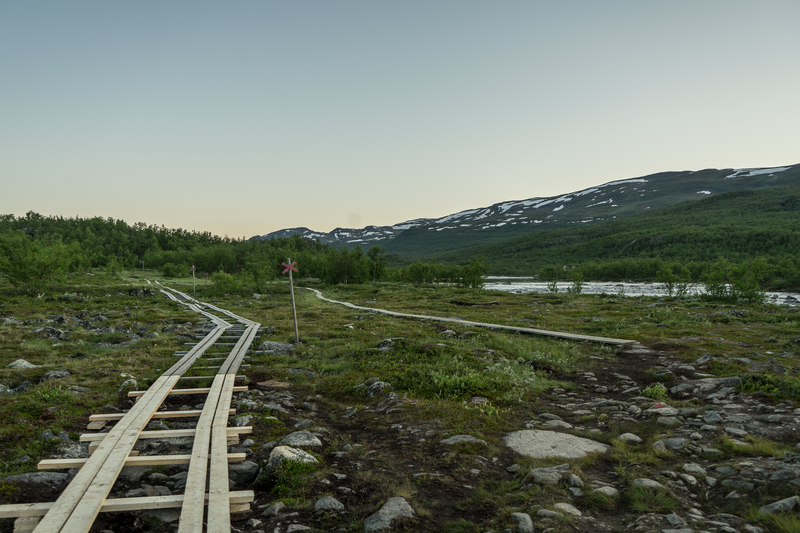 Eventually I made it to Vakkotavare, the first place that was accessible by road and welcome end point for most people. I was only halfway but already looked back and thought of the two hikers I had seen when I had first started walking. I knew now how they must have felt. 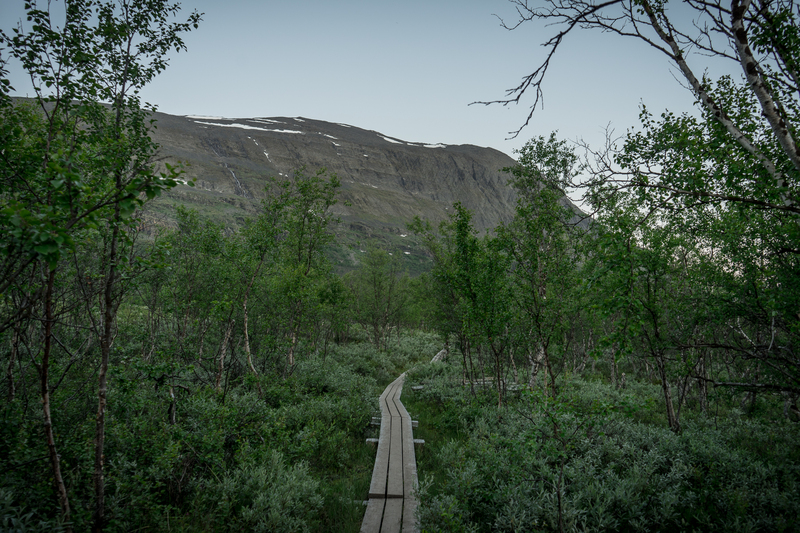 Kungsleden part I had pushed me both physically and mentally. I was exhausted but also extremely satisfied. Our body and soul are capable of so much more than we think, if only we’re blunt enough to challenge them. By doing things instead of talking about them. Without overthinking the whole process or trying to plan every little detail. You are a ghost driving a meat covered skeleton made from stardust riding a rock floating through space. Fear nothing. Great world, great spirit, great physical condition, great writing !